As a user of both a PC and a Mac, there are times when I dock my Mac that is connected to a Windows PC keyboard. As you know, in macOS, you use keyboard shortcuts like Command ⌘ C and Command ⌘ V for copy and paste. In Windows, you would use Control C and Control V. However, if you’re using a Windows PC keyboard on a Mac, Control C and Control V no longer work. To use the default PC keyboard mappings in macOS, you’ll usually need to use the Windows key whenever you would use the Command ⌘ key on the Mac keyboard. So for copy, you would use Windows C and for paste you would use Windows V.
If you don’t want to use the Windows key, you can also set custom application keyboard shortcuts (pictured above). You can set universal keyboard shortcuts in System Preferences > Keyboard > Keyboard Shortcuts > Application Shortcuts > All Applications. You can then enter menu values (Save, Copy, Paste, etc) and assign new key combinations to them. In the image above, I’ve set Control C to copy and Control U to paste. 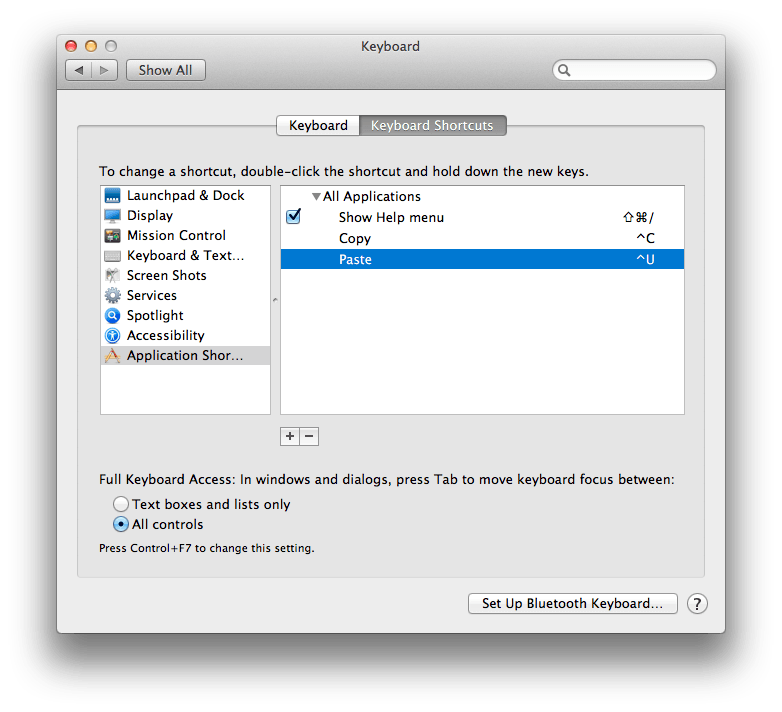 Another option you have is to create a DefaultKeyBinding.dict file and create a list of all the keyboard shortcuts you want to use on your Mac. WARNING: This will overwrite any default keyboard shortcuts that are standard on a Mac, i.e. Control V for Page Down. ^ is the symbol for the Control key in this example.